The 41.1 metre Palmer Johnson Dragon has been listed for sale by Camper & Nicholsons. Built in aluminium and GRP, Dragon was delivered in 2007. Designed inside and out by Nuvolari Lenard, with naval architecture by the yard, Dragon has a striking profile of aggressive lines that give her a muscular presence in the water. Her interior, commissioned by her owner to represent the style of his significant modern art collection, is finished in touches of red and black. With a focus on form following function, the vast open spaces of Dragon include a generous saloon and dining space for 10 guests. These areas work together to create a natural flow from one area to the next. 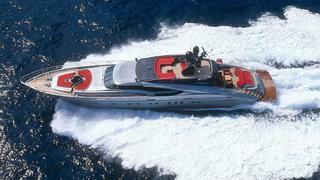 Dragon accommodates 10 guests in five suites, all located on the lower deck. The full beam master suite sits amidships, boasting a study, a private lounge and his and hers en-suite bathrooms with steam room. Teak decking extends around this yacht for sale, allowing guests to easily reach the bathing area at the bow that surrounds a Jacuzzi. This feature can be covered to transform the area into a bar for evening cocktails. Aft, there’s an al fresco dining area, bar and further seating. Two 7300hp MTU engines power Dragon to a top speed of 35 knots, with a cruising speed at 27 knots and a range of 3,000 nautical miles. Dragon is asking $11,500,000 with Camper & Nicholsons.